Looking for Country RealTracks and RealDrums? PG Music makes it easy with Country RealPAKS 1-15! Country RealPAKs 1-15 include a collection of PG Music's popular RealTracks and RealDrums for Country. These are not samples, but full recordings by professional musicians that replace the MIDI track in your arrangement and play along in sync to the chord progressions you enter. RealTracks Set 320: Chicken Pickin' with Johnny Hiland! Includes 74 Country, Americana, and Celtic RealTracks in Sets 278-285. RealTracks Set 278: Shiny Vocal Oohs & Aahs! Includes 63 Country, Folk, and World RealTracks in Sets 254-263. Includes 67 Country RealTracks in Sets 245-253. Includes 32 Country RealTracks in Sets 221-227. RealTracks Set 166: Praise & Worship – Modern Groove. 3 Electric Basses, Acoustic Guitar, 7 Electric Guitar, 3 Acoustic Pianos, and 3 Synth Pads. Plus many Direct Input guitar, and PopModernGrooveSync RealDrums. RealTracks Set 167: Country Boogie and More. 7 Electric Basses, Cello, 4 Electric Guitars, 2 Acoustic Pianos. Plus Many Direct Input guitars. RealTracks Set 168: Western Swing Soloists. Fiddle, Resonator Guitar, Mandolin, and Acoustic Piano. RealTracks Set 169: Killer Country Soloing. Fiddle, Resonator Guitar, Mandolin, and Acoustic Piano. Requires Band-in-a-Box® 2010.5 or higher. 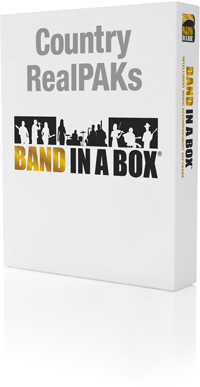 **Note: RealPAK Country 4 requires Band in a Box 2010.5. Includes Country RealTracks Sets 46, 49, 59, 60 ,61, 62, 63, 64, 65, 66 and the Country RealDrums Sets 25-26.